Deep vein thrombosis is a frequent complication following total joint arthroplasty and other major orthopedic procedures. Pulmonary embolism occurs with or without a diagnosis of deep vein thrombosis, although infrequently (1.5%–10%). In patients with congenital cardiac defects, such as a patent foramen ovale, paradoxical cerebral embolism may also occur. This article describes a case of a 52-year-old woman who sustained a paradoxical cerebral embolism following total knee arthroplasty. In the workup of a patient with a known murmur and stroke symptoms, paradoxical cerebral embolism should be included in the differential. The initial evaluation should incorporate transesophageal echocardiography because of its accuracy in the demonstration of the cardiac physiology. An abnormal intracardiac or intrapulmonary shunt is essential for paradoxical cerebral embolism, allowing the entrance of the thrombus into cerebral circulation from the venous system. No clear consensus has been reached on the management of patients at risk for paradoxical cerebral embolism prior to orthopedic procedures. However, when an embolic stroke is diagnosed acutely, ideal management includes thrombolytic therapy, but further research is needed to confirm that this is the correct management. Due to the risk of recurrence, postoperative thromboprophylaxis is recommended with or without closure of the foramen ovale. 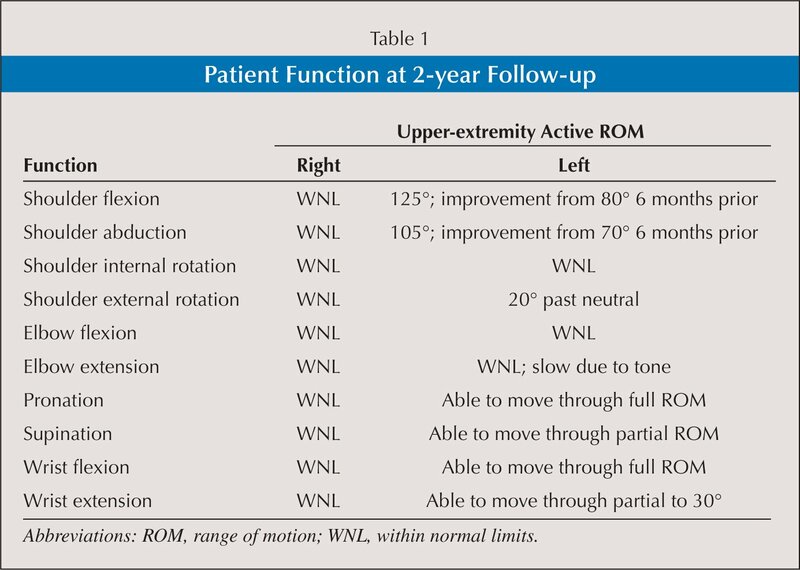 Most importantly, and as demonstrated by the current patient, who partially recovered but did not require walking assistance after 2-year follow-up, treating physicians should be prepared to counsel patients through a lengthened physical rehabilitative process. Drs Hill, Huang, and Li are from the Department of Orthopaedic Surgery, Regions Hospital, University of Minnesota, St Paul, Minnesota. Drs Hill, Huang, and Li have no relevant financial relationships to disclose. Correspondence should be addressed to: Mengnai Li, MD, PhD, Department of Orthopaedic Surgery, Regions Hospital, University of Minnesota, 640 Jackson St, Mailstop 11503L, St Paul, MN 55101 (mengnai.x.li@healthpartners.com). Deep vein thrombosis (DVT) has been recognized as a potential complication following arthroplasty procedures.1–4 Pulmonary embolism can also occur with or without a diagnosis of DVT, although infrequently.3 Cases of paradoxical pulmonary embolism are rare, with few published as case reports.5–8 This article describes a case of a patient with paradoxical cerebral embolism after a total knee arthroplasty (TKA) that resulted in hemiparesis. A 52-year-old woman underwent elective right TKA with a diagnosis of degenerative joint disease and worsening knee pain that was recalcitrant to conservative treatment. Her medical history was significant for type 2 diabetes mellitus, hypercholesterolemia, carpal tunnel syndrome, depressive disorder, and a slight cardiac murmur since childhood. Her body mass index was 36.6 kg/m2. Preoperative assessment and physical examination included an electrocardiogram, which showed a sinus rhythm with nonspecific T wave abnormality, no evidence of ischemia or infarction, and normal left ventricular function. Other laboratory results, including coagulation profile, were within the normal range. The patient had no apparent operative risk; thus, no intervention was given. The TKA was performed under general anesthesia and a femoral nerve block. The total procedure was performed with a tourniquet time of 84 minutes at 300 mm Hg. The patient tolerated the procedure, and no acute perioperative complications occurred. Thirty-three hours postoperatively, the patient began to experience episodes of transient tachycardia with a heart rate from 113 to 124 and concurrent hypotension of 80/61 mm Hg (sytolic/diastolic). She reported shortness of breath and recorded drops in O2 saturation (86% on a 6-L nasal cannula). Troponin levels elevated and calculated glomerular filtration rate dropped to 47.2/1/73 m2 mL/minute. An electrocardiograph showed a sinus rhythm but an incomplete right bundle branch block, indicating inferior ischemia. Pulmonary embolism was suspected; however, spiral computed tomography angiogram of the chest was negative. Five hours following this episode, the patient reported blurry vision with difficulty focusing. She also had left facial droopiness and hemiparesis with normal sensation and a flat mood. Stroke (most likely embolic instead of hemorrhagic) was the working diagnosis, and a head computed tomography scan 2 hours after the onset of the preliminary symptoms demonstrated a subtle low density in the posterior aspect of the right frontal lobe, indicating mild acute ischemia. Magnetic resonance imaging of the brain displayed an embolic infarct in the right perirolandic area (Figure 1). A subsequent echocardiograph showed left ventricular ejection fraction of 55% but an inconsistent bubble. Transesophageal echocardiograph demonstrated a positive bubble study with a 2- to 3-mm patent foramen ovale. Doppler ultrasound of the lower extremities was performed due to edema and showed occlusive clotting in the right posterior tibial vein extending from mid-calf to the ankle, but no evidence existed of DVT in the left lower extremity. Because the patient had recently undergone TKA, the medicine team did not proceed with thrombolytic therapy. 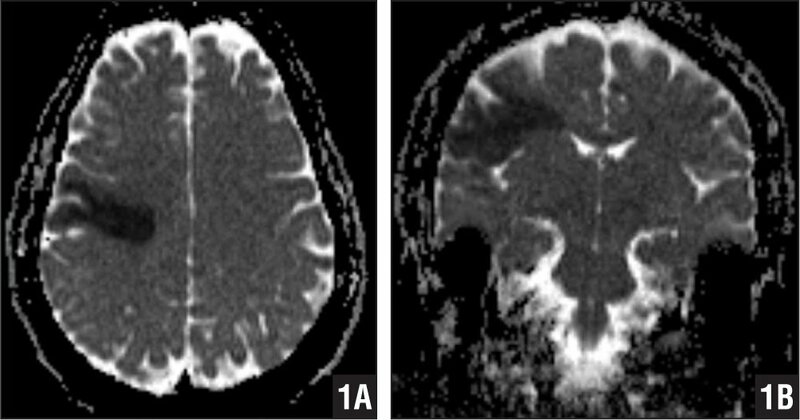 Figure 1: Diffusion weighted axial (A) and coronal (B) magnetic resonance images of the brain showing restricted diffusion in the pre- and postcentral gyri. This reading is consistent with a moderate-sized embolic infarct in the right perirolandic area. 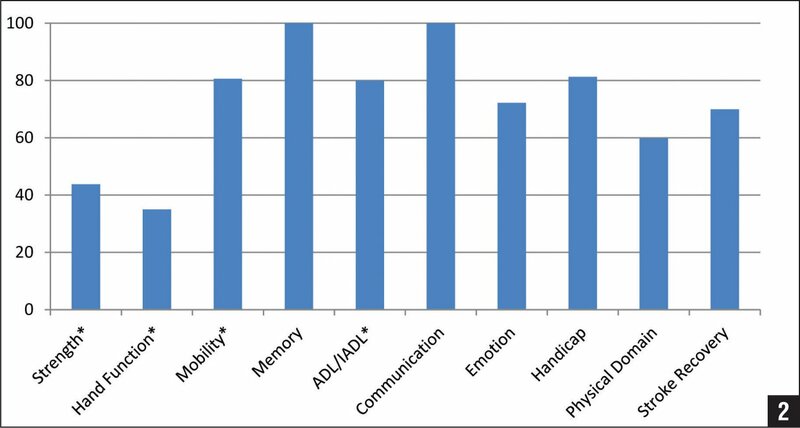 Figure 2: Summary report of Stroke Impact Profile. These 4 dimensions create the physical domain (asterisk). All scores are normalized values ranging between 0 (maximum dysfunction) and 100 (no dysfunction). Conheim16 first described paradoxical cerebral embolism in 1877 as venous thrombosis causing systemic embolization through a right-to-left shunt. With a prevalence of 26% in healthy patients,17 a patent foramen ovale can be detrimental in a patient with a traveling thrombus. In the current case, an occlusive thrombus was found in the posterior tibial vein of the operative side by Doppler ultrasound, likely the source of systematic embolus traveling through a congenital cardiac shunt. Despite the relatively high prevalence of patent foramen ovale, a paradoxical cerebral embolism is rare because the foramen ovale is closed by the pressure gradient of the left and right atria. An increase in right atrial pressure is required to create the right-to-left shunt. In the current case, before the onset of left hemiparesis on postoperative night 2, unexplained episodes of hypoxia, hypotension, and tachycardia occurred. Pulmonary embolus is the most common cause of acutely elevated right atrial pressure and right-to-left shunt in patients with patent foramen ovale or atrial septal defect, which occurs in at least 60% of paradoxical cerebral embolism episodes.22 In the circumstance of combined paradoxical cerebral embolism and PE, the greatest danger of further paradoxical cerebral embolism seems to occur in the first few hours after the initial episode of PE.24–26 The current case had the characteristics of a PE episode before the paradoxical cerebral embolism. The onset of left hemiparesis happened 5 to 6 hours after episodes of unexplained shortness of breath and hypoxia, although a computed tomography angiogram of the chest revealed no pulmonary embolus. Paradoxical cerebral embolism following TKA is rare but potentially catastrophic. Paradoxical cerebral embolism should be included in the differential in the work-up of patients with known murmurs and stroke symptoms. Initial evaluation should include transesophageal echocardiography because of its accuracy in the demonstration of the cardiac physiology. When an embolic stroke is diagnosed acutely, ideal management includes thrombolytic therapy; however, further research is needed to confirm that this is the correct management. Most importantly, treating physicians should be prepared to counsel patients through a lengthened physical rehabilitative process. Berman AT, Parmet JL, Harding SP, et al. Emboli observed with use of transesophageal echocardiography immediately after tourniquet release during total knee arthroplasty with cement. J Bone Joint Surg Am. 1998; 80(3):389–396. Tangsataphorn S, Chareancholvanich K. Paradoxical embolism in bilateral total knee arthroplasty: a case report. J Med Assoc Thai. 2009; 92(10):1387–1392. Thienpont E, Kaddar S, Morrison S. Paradoxical fat embolism after uncemented total hip arthroplasty: a case report. Acta Orthop Belg. 2007; 73(3):418–420. Bellamy N, Buchanan WW, Goldsmith CH, Campbell J, Stitt LW. Validation study of WOMAC: a health status instrument for measuring clinically important patient relevant outcomes to antirheumatic drug therapy in patients with osteoarthritis of the hip or knee. J Rheumatol. 1988; 15(12):1833–1840. Stulberg BN, Insall JN, Williams GW, Ghelman B. Deep-vein thrombosis following total knee replacement. an analysis of six hundred and thirty-eight arthroplasties. J Bone Joint Surg Am. 1984; 66(2):194–201. Stringer MD, Steadman CA, Hedges AR, Thomas EM, Morley TR, Kakkar VV. Deep vein thrombosis after elective knee surgery. An incidence study in 312 patients. J Bone Joint Surg Br. 1989; 71(3):492–497. Rogers BA, Little NJ. Thromboprophylaxis in orthopaedic surgery: a clinical review. J Perioper Pract. 2010; 20(10):358–362. Cohnheim J. Vorlesungen Űber Allgemeine Pathologie. Berlin, Germany: Hirschwald; 1877. Hagen PT, Scholz DG, Edwards WD. Incidence and size of patent foramen ovale during the first 10 decades of life: an autopsy study of 965 normal hearts. Mayo Clin Proc. 1984; 59(1):17–20. Giachino AA, Ostrowski J, Feibel RJ. Stroke as a complication of total joint arthroplasty. J Bone Joint Surg Br. 1998; 80(suppl 1):8. Christie J, Robinson CM, Pell AC, McBirnie J, Burnett R. Transcardiac echocardiography during invasive intramedullary procedures. J Bone Joint Surg Br. 1995; 77(3):450–455. Ozelsel TJ, Tillmann Hein HA, Marcel RJ, Rathjen KW, Ramsay MA, Jackson RW. Delayed neurological deficit after total hip arthroplasty. Anesth Analg. 1998; 87(5):1209–1210. Leeson P, Al-Mousawi A, Timperley J, et al. Patent foramen ovale closure before orthopedic trauma surgery to reduce risk of recurrent systemic fat embolism. J Trauma. 2008; 65(2):467–469. Greenfield LJ. Current indications for and results of greenfield filter placement. J Vasc Surg. 1984; 1(3):502–504.